How Can Pink Elephant Consulting Expertise Help You & Your Organization? Why Choose Pink For Consulting? Pink Elephant has developed industry-leading onsite team workshops, simulations and assessments which can be tailored to your organization’s specific needs. We like to say that we translate knowledge into real world results. For nearly 40 years, we have made it happen for hundreds of satisfied organizations. 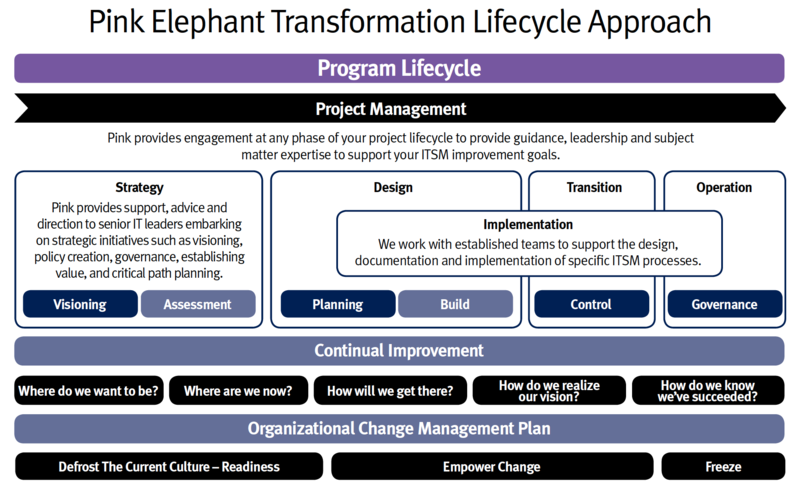 Take a look at the diagram below to better understand how our unique Transformation Lifecycle Approach can be customized for your organization. As trusted advisors, our experienced consultants are responsible for enabling and supporting project sponsors, process owners, project managers, and internal process teams by providing advice, proven methods, and a host of resources and online tools from our experience with past project successes. To learn more about how Pink Elephant can help you define, drive and realize your business vision contact us at +60 3 8605 3610 or email us.